In preparation for a script for Sound Vision, I had been reading Dr. Muhammad Hamidullah’s books for the last three days when I heard the news of his departure from this world. I will not use the word “sad” in mentioning him. He has, Alhamdu Lillah, contributed substantially to this world. He was successful in this world and we pray that Allah accepts his contributions and rewards him with the best place in paradise. I am pretty sure he would request books in Paradise as well. We all return back to our Creator. Inna lillahe wa inna ilaihe rajeoon. 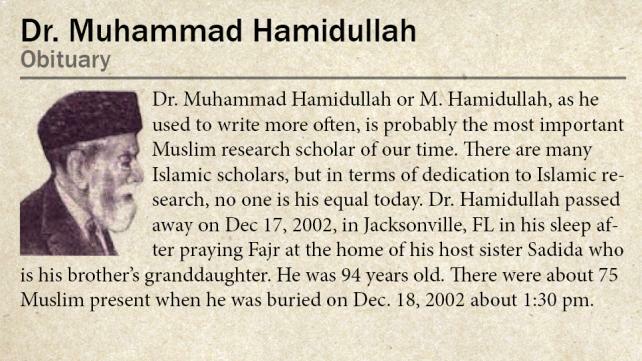 Dr. Hamidullah passed away on Dec 17, 2002, in Jacksonville, FL in his sleep after praying Fajr at the home of his host sister Sadida who is his brother’s granddaughter. He was 94 years old. His funeral prayers were led by a Turkish-American scholar Dr. Yusuf Ziya Kavakci, Imam Islamic Association of North Texas. There were about 75 Muslim present when he was buried on Dec. 18, 2002 about 1:30 pm. His last major contribution was a lecture series which is known as “Khutbat e Bhawalpur” He delivered these 12 exceptional lectures in Rabiul Awwal 1400 Hijrah (March 1980) in Bhawalpur, Pakistan in celebration of the year 1400 of Hijrah. He completed the final revision of the book on 26th Ramadan 1408 (in 1988). The Islamic Research Institute in Islamabad, Pakistan, has published its translation in English as well. I have read this 400-page plus book and have consulted it many times. Dr. Hamidullah presented these 400 pages verbatim, without any notes whatsoever, to an audience of scholars and students at the Bhawalpur Islamic University. With his amazing memory, he represents part of a great tradition of early Islamic scholarship, when good memory was a scholar’s essential asset. Last June, I gave a few lectures on the Prophet’s life at the University of Toronto to a select Muslim audience. While researching for those lectures, I ended up reading and referring to more than 20 works on the Prophet’s life. These included the books of scholars Shibli Numani, Sulaiman Nadawi, Husain Haikal, Martin Lings, Ibn Hisham, as well as the books Rasool Number of Nuqoosh, Rahiqal Makhtum, and Saiyarah Digest. I also consulted several of Dr. Hamidullah’s books. Although my aim was not a comparative study of biographies of the Prophet, it became so when I studied the material. For example, searching for information about the Hilf al-Fudul was an extraordinary struggle. Hilf al-Fudul was a pre-Islamic pact to assist the helpless in Makkah. The Prophet was a part of it before he became a Prophet. Even after the Prophet migrated to Madinah and became the city’s leader, he stated his support for this pact. I was researching Hilf al-Fudul to include in my lecture on “Social Services in the Prophet’s Life.” It was no surprise to me that the best detailed description I could find was in Dr. Hamidullah’s contribution to that topic in the Daira Muarifal Islamia (Urdu Encyclopaedia of Islam) published by the Punjab University in Lahore, Pakistan. It is the best research one can find in any language on that topic. Its references even took more space than most of the other works on the same topic. It was his urge for thoroughness in research that brought him outside Hyderabad, Deccan in India, where he was born. After exhausting the libraries of Hyderabad, he visited those of Makkah, Madinah, Syria, Palestine, Egypt, and Turkey. These trips taken in early 1930’s were taken at a time when travel afar was very difficult and flying around the world, unless you were very rich, was unheard of. This research investigation that took him to so many countries is essentially presented in his book “The Muslim Conduct of State”. He wrote this as his master’s thesis for Osmania University in Hyderabad, Deccan. Dr. Hamidullah completed his first Doctorate degree from Bonn University in Germany in 1933 in a span of only nine months. He then acquired another doctorate degree from the University of Paris on “Early Muslim Diplomacy” the next year. Both of these dissertations interestingly are only one chapter each in the above mentioned book. Born on 16 Muharram 1326 (Feb. 19, 1908) in Hyderabad Deccan, he was always committed to Hyderabad Deccan. He was Hyderabad’s ambassador to the United Nations when India attacked and forcefully occupied Hyderabad Deccan, an independent Muslim state. He decided not to return to the occupied land and stayed on in Paris, France on an asylum visa endoresed by the UN that he is a stateless person. He remained a stateless Hyderabadi citizen without ever applying for the French citizenship. He never visited his occupied homeland. That was his commitment to his country Hyderabad and probably a form of silent protest. Once he realized that the cause of his country’s independence from India was abandoned by its people, he dedicated his life to Islamic learning and communication in the Western Hemisphere. He is not only the most important graduate of Osmania University Hyderabad, with master’s and law degrees, but was also a professor there until he was appointed Hyderabad’s ambassador. In Paris, he remained a scholar for France’s National Center of Scientific Research for 20 years before dedicating himself to serve Islam. After he was struck with Alzheimer’s disease, he moved to Pittsburgh, PA probably in 1995 and later to Jacksonville, FL. Dr. Hamidullah’s contribution to Dawa includes his translation of the Quran in French, “Le Saint Coran”. It is more widely used in the French-speaking countries of Africa and France than Abdullah Yusuf Ali’s translation in the English- speaking world. His “Le Prophete de l’Islam” has been popular in French, English, and Slavic. His book “Introduction to Islam” has been translated in more than 12 languages, and has been published legally and illegally. Dr. Hamidullah’s foremost research is in Islamic history and Muslim international law. He asserts the uniqueness of Muslim international law very powerfully in his book “Muslim conduct of State”, and defines it as “being a treatise on Siyar, that is, Islamic notion of Public International Law, consisting of the Laws of War, Peace and Neutrality together with Precedents from Orthodox Practice” of Islam. Dr. Hamidullah’s other contribution includes his research and publication of Sahifa Humam bin Mumbah, which is the oldest collection of Hadith complied at the time of Sahabah. He also published a bibliography of Quran translations in 120 languages of the world, along with translations of the first chapter. He also did a comparative study of all the three of the earliest copies of the Quran found in the world. One in Tashkent, Uzbekistan, another in Istanbul, Turkey and one in India Office Library, London, UK. All three have been traced back to the time of third Khalifa Usman ibn Affan, may Allah be pleased with him. Dr. Hamidullah said all three were written on a similar type of skin, and look authentic for that period. He also said, after seeing bloodstains on the Turkish copy, that this was what Usman was studying from when he was killed. I have seen a limited edition of Dr. Hamidullah’s comparative version of the Tashkent copy with modern script of the Quran. He wanted to publish the whole Quran with Tashkent script on the right and current script on the left. Most of Dr. Hamidullah’s works are highly relevant and useful in the current environment of attacks on the Prophet and Islam. Sh. Muhammad Ashraf publishers, who have printed and distributed some of his books, have done an admirable job of keeping Dr. Hamidullah’s books in print. They are also the ones who introduced the Abdullah Yusuf Ali translations to the world and hold copyrights for it as well. Sh. Muhammad Ashraf, the man who started this company, died and his grandson, is now running the family business. I spoke to him about asserting copyrights on Yusuf Ali’s translation so it will not go through the abuse it is going through at this moment. I wish either Sh. 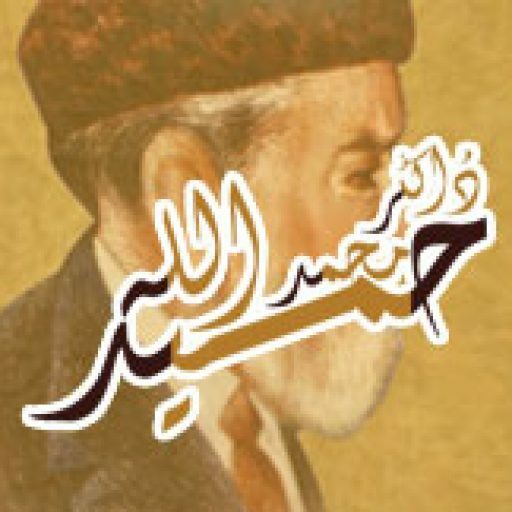 Muhammad Ashraf publishers of Lahore, Pakistan themselves come up with better quality prints of his books which are suitable for the Western market, or the Islamic Research Institute of Islamabad takes over the republishing of Dr. Hamidullah’s works. The latter has done a better job of printing “Khutbat e Bhawalpur” and its English translation with quality. Dr. Hamidullah has done his job, Alhamdu lillah. Let’s do ours. We need Muslim writers and scholars who are willing to pick up where Dr. Hamidullah has left. I sat down with my family after Isha prayers yesterday and we discussed him and went through with some of his books. I hope you can do the same. Maybe you can also request your Imam to mention him in his Khutba and pray for him this Friday.